A viral video showed a white woman on the phone, calling the police on an 8-year-old black girl who was selling water bottles Friday afternoon near AT&T Park, according to the girl's mother Erin Austin. Marianne Favro reports. We had #BBQBecky and #JoggerJoe, and now there's #PermitPatty. A viral video showed a white woman on the phone, calling the police on an 8-year-old black girl who was selling water bottles Friday afternoon near AT&T Park, according to the girl's mother Erin Austin. "Yeah, illegally selling water without a permit," the woman said in Austin's video, which was initially posted on her Instagram story. Austin later posted the video as a post on her Instagram with the caption: "an 8-year-old selling water in front of her apartment building where she’s lived her whole life is NOT a reason to call the Police." She also called the woman "#PermitPatty." The viral exchanged occurred near an apartment building on Townsend and 2nd Street. Austin said the police never showed up after the phone call. San Francisco Police has not responded to NBC Bay Area's request for comment. "I'm upset she had to go through this," said Austin. "I didn't think in San Francisco my biracial child would have to go through something like this." The #PermitPatty video sparked outrage and continued conversations about policing and racism. "I highly doubt she was on anyone else's cases about whether they have a permit," said San Francisco resident Kari Estrada. The woman on the video has been identified on social media as Alison Ettel who lives in the area. NBC Bay Area went to her apartment but could not reach her. On a Facebook page that appears to be hers, a post reads, "There is always so much more to a situation than meets the eye, please don't ever forget that." Ettel told a newspaper reporter that the girl was too loud and disturbing her work so she pretended to call police. However, the viral video was enough to convince one company to stop doing business with Ettel who sold cannabis products for dogs. In a social media post, Magnolia Wellness Cannavis Dispensary says "As of today Magnolia will no longer be doing business with Treatwell Tinctures after seeing this video of their CEO calling the police on an 8 year old entreprenuer selling water on a hot day we decided without hesitation we could no longer patronize her company." 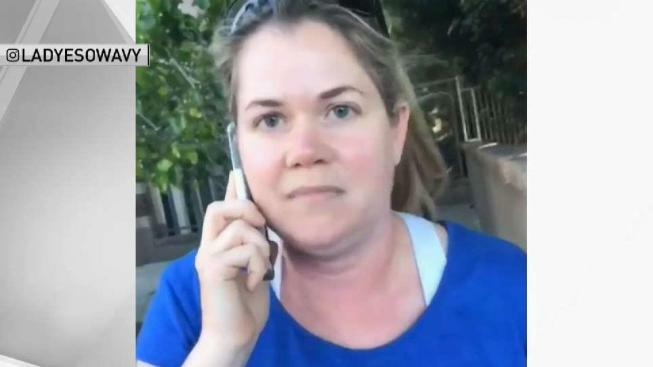 In a similar incident in Oakland, a woman dubbed "BBQ Becky" called police to report an African-American man who was using a charcoal grill in an area where they are not allowed. "Oftentimes when African-American people are involved, it leads to an escalation of police force," said community organizer Carol Fiffe said about the Lake Merritt incident.